Currently, we provide professional finance and accounting services to SMEs, CFOs of large corporations, accounting firms, and set up shared services centers for clients in the United States, Australia, United Kingdom, Europe, and Asia. We are consistently growing our client portfolio worldwide. We empower SMEs by providing them with practical solutions to modernize and simplify their overall accounting processes. We take them to the cloud so they may access everything online, making it easy for them to evaluate their business performance straightforwardly. We help CFOs by serving as a right-hand in their multifaceted functions, from the elements that comprise management accounting, to overseeing payroll, credit control, and bookkeeping systems, as well as in-depth financial planning and analysis. We generate data-driven recommendations to help CFOs and management make better business decisions. When workload becomes disproportionate with workforce, D&V is here to help you with extra hands, enabling your accounting firm to fulfill all your commitments to your clients, with the assurance of complete operational control. D&V Philippines can set up a Shared Services Center in Manila for your company’s operations worldwide to streamline all of your back-office finance and accounting needs, as well as administrative operations. Our vision is to be the unrivaled Finance and Accounting outsourcing solutions provider in the Philippines, extending our premium services to SMEs, CFOs of large corporations, accounting firms, and shared services centers all over the world. We aspire to progressively innovate Finance and Accounting outsourcing practices with the latest technologies, combined with our forward-thinking talents who are passionate about improving business processes and helping clients succeed in all their business endeavors. Our mission is to provide high-quality, cost-effective finance and accounting services to SMEs, CFOs of large corporations, accounting firms, and shared services centers worldwide through our mantra, the ESSAP approach, which stands for: Eliminate, Simplify, Standardize, Automate, Philippines—all of which are designed to significantly improve business processes. We are committed to recruiting only the most talented forward-thinkers in the industry, alongside utilizing the best technologies for the most efficient procedures. We are devoted to give our best efforts and resources to our clients and stakeholders, continuously exceeding expectations to remain in the forefront of the finance and accounting services industry. Our organization is founded on trust and respect, driven by our commitment to always do what is right and fair for all. We believe that the only way to success is through dedication in performing excellent work, and we do so with passion for our profession. We make it a priority to build long-term relationships with our clients, employees, and stakeholders by honoring our commitments and giving them our best efforts and resources. In our organization, we make sure that everyone enjoys what they do, because when they do, they thrive. 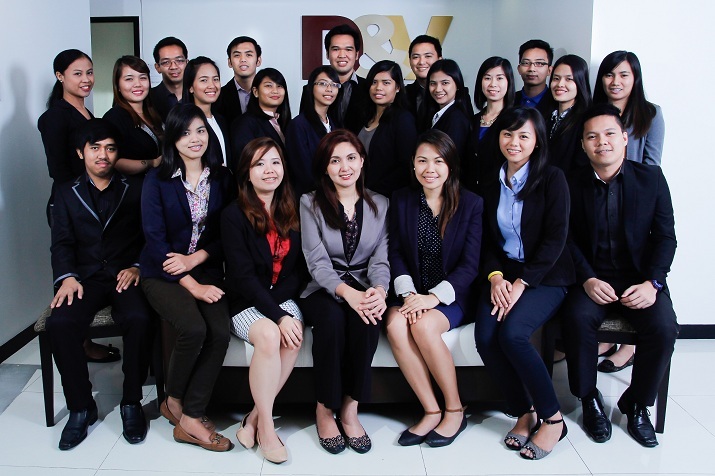 At D&V Philippines, our PEOPLE are our most important ASSET. All together we work, learn, and grow as we strive for excellence and quality. We’re as diverse as the clients we serve from different parts of the globe: Australia, US, UK, Europe, and Asia. We are full of keen, driven, young and talented professionals, helping our clients address their toughest challenges and developing innovative solutions. We are exceptional problem solvers. The richness of each member’s backgrounds gives D&V the range of expertise we need to help our clients’ small-to-medium enterprises (SME) grow, streamline their certified public accountant (CPA) firms, support their chief financial officer (CFO), and other financial problems they face with professionalism. D&V’s people truly become a valuable extension of our clients' teams. We work to understand their reality in order to show them that we're in this together. We think and act like business partners. We share the same goals resulting to success and satisfaction in what we do. Yes, we work hard and we play hard. We enjoy what we do and we believe in a “work-life balance” lifestyle. With our unique culture, we attract innovative and dynamic people who enterprise our growth as a global organization. Want to get to know the brilliant team behind D&V’s Operations? Meet the D&V Management Team Here. Interested to boost your career and join our team of brilliant forward-thinkers? Visit our Careers Page to learn more.